Weaning involves the permanent separation of the calf from the dam and has been shown to be stressful for both. The objectives of this study were to characterise the effect of i) abrupt weaning and ii) subsequent housing on the extended physiological and immunological responses of beef cows. At weaning (day (d) 0, mean age of calf (s.d.) 212 (24.5) d), cows were abruptly separated from their calves and returned to the grazing area. After 35 d at pasture, cows were housed in a slatted floor shed and offered grass silage ad libitum plus a mineral-vitamin supplement daily. Rectal body temperature was recorded and blood samples were obtained on i) d 0 (weaning), 2, 7, 14, 21, 28, 35 and subsequently on ii) d 0 (housing), 2, 7, 14 and 21 for physiological, haematological and immunological measurements. Post-weaning, concentration of cortisol and dehydroepiandrosterone were unchanged (P > 0.05). Rectal body temperature, neutrophil number and neutrophil: lymphocyte ratio increased (P < 0.01) on d 2 compared with pre-weaning baseline. Lymphocyte and neutrophil number decreased (P < 0.05) on d 2 to 7 and d 7 to 21, respectively, compared with pre-weaning baseline. Interferon-γ production decreased (P < 0.05) on d 2 compared with pre-weaning baseline. An increase (P < 0.05) in acute phase proteins, fibrinogen and haptoglobin was evident on d 2 to 35 compared with pre-weaning baseline. Concentration of glucose increased on d 2 to 28, whereas non-esterified fatty acid decreased on d 2 to 35 compared with pre-weaning baseline. Post-housing, concentrations of cortisol, rectal body temperature, total leukocyte number, and glucose were unchanged (P > 0.05). On d 2 post-housing, neutrophil number and neutrophil: lymphocyte ratio increased (P < 0.05), whereas lymphocyte number and concentrations of dehydroepiandrosterone, fibrinogen and non-esterified fatty acid decreased (P < 0.05) compared with pre-housing baseline. Concentration of haptoglobin increased (P < 0.05) on d 14 to 21 post-housing. A transitory increase in neutrophil number and decrease in lymphocyte number, increased neutrophil:lymphocyte ratio coupled with decreased interferon-γ production, and increased concentration of acute phase proteins indicate a stress response in cows post-weaning, whereas post-housing, changes were less marked. Within seasonal grassland-based, spring-calving suckler beef production systems calves are generally allowed continuous and unlimited nursing of the dam for approximately 6 to 8 months until weaning at the end of the grazing season. Husbandry management practices, including weaning and housing, form integral components of these beef production systems, and often expose beef cattle to novel environmental, physical and psychological stressors. Research measuring stress-related variables in cattle has focused on parturition , routine handling [2, 3], mixing with unfamiliar cattle [4, 5], transportation [6, 7], restrictive space allowance during indoor housing , and weaning of the calf . However, limited research has examined weaning stress in the cow. The effect of weaning on concentration of cortisol in the cow is equivocal with no change  and an increase  reported. Furthermore, these studies were limited up to 48 h and 6 d post-weaning, respectively. Extended effects of weaning on physiological and immunological responses were found in beef calves  but have not been examined in beef cows. At the end of the grazing season in autumn, weaned cows are typically housed indoors over the winter period [13, 14]. In beef cattle, housing research has focused on the effect of varying space allowance [8, 15], and floor type [16, 17] on production and behavioural responses. There is limited data available on the effects of moving animals from an outdoor grazing environment to indoor accommodation in slatted floor sheds. 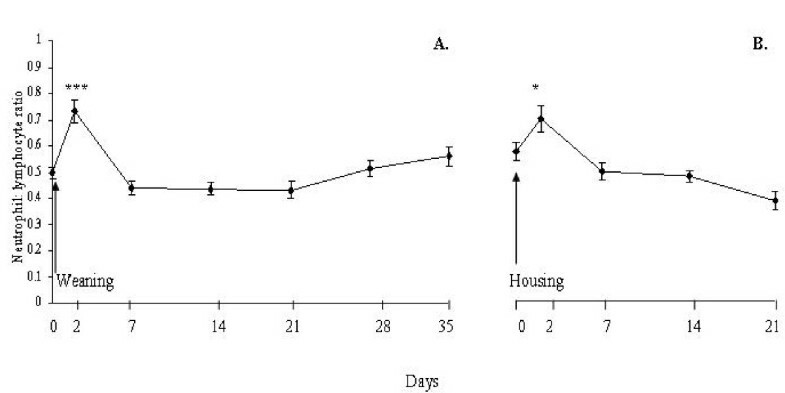 Previously grazed cows that were tethered during indoor housing had increased concentration of cortisol for up to 7 days post-housing . Research on the extended effect of indoor housing on other stress related variables is warranted. Therefore, the objectives of the study were to characterise the extended physiological (rectal body temperature, cortisol, dehydroepiandrosterone (DHEA), glucose, non-esterified fatty acid (NEFA), β-hydroxybutyrate (βHB), total leukocyte number and differentials, red blood cell number (RBC), haemoglobin concentration (HGB), haematocrit percentage (HCT)), and immunological (interferon (IFN)-γ production and acute phase proteins) responses in beef cows to i.) abrupt weaning and ii.) subsequent housing. Rectal body temperature increased (P < 0.01) on d 2 (mean (s.e.) 38.7 (0.04)°C) compared with pre-weaning baseline (d 0 at weaning: mean (s.e.) 38.4 (0.05)°C). Rectal body temperature did not differ (P > 0.05) on d 7 to d 35 compared with d 0. Post-housing, rectal body temperature did not differ (P > 0.05) from pre-housing baseline (d 0 at housing) (data not shown). Concentration of cortisol was lower than 7.5 ng/mL in cows at all sampling points during the study. On d 2 post-weaning, concentration of cortisol (mean (s.e) 4.4 (0.34) ng/mL) decreased (P < 0.05) by 24% compared with pre-weaning baseline (mean 5.8 (s.e) 0.39 ng/mL). Concentrations of cortisol did not differ (P > 0.05) from pre-weaning and pre-housing baselines for the remainder of the study (Data not shown). Post-weaning, concentration of DHEA did not differ (P > 0.05) from pre-weaning baseline, whereas following housing, concentration of DHEA decreased (P < 0.05) by 51% on d 2 (mean (s.e.) 1.9 (0.55) ng/mL) to 67% on d 21 (mean (s.e.) 1.3 (0.31) ng/mL) compared with pre-housing baseline (mean (s.e.) 3.9 (0.65) ng/mL). The cortisol: DHEA ratio did not differ (P > 0.05) from pre-weaning and pre-housing baselines at any sampling time-points (Data not shown). Post-weaning, there was a 30% increase (P < 0.001) in neutrophil number with a concurrent 10% decrease (P < 0.05) in lymphocyte number, which resulted in an increase (P = 0.07) in total circulating leukocyte number on d 2 compared with pre-weaning baseline (Figure 1). Subsequently on d 7, total leukocyte number decreased (P < 0.05) and returned to pre-weaning baseline by d 14. This decrease in total leukocyte number reflected the 15 - 22% decrease (P < 0.05) in neutrophil number on d 7, 14 and 21 with a concurrent 11% decrease (P < 0.01) in lymphocyte number on d 7 compared with pre-weaning baseline. The N:L ratio increased (P < 0.001) by 49% on d 2 and returned to pre-weaning baseline on d 7 (Figure 2). Post-housing, neutrophil number increased (P < 0.05) by 18% and lymphocyte number decreased (P < 0.01) by 9% on d 2 and both returned to pre-housing baseline by d 7. Total leukocyte number did not differ (P > 0.05) post-housing compared with pre-housing baseline. The N:L ratio increased (P < 0.05) by 21% on d 2 and returned to pre-housing baseline by d 7 (Figure 2). Effect of abrupt weaning and subsequent housing on total leukocyte, neutrophil, and lymphocyte number in beef cows. TL = Total leukocyte number, L = lymphocyte number and N = neutrophil number. Significant differences between d 0 (pre-weaning) and d 35 baselines (pre-housing) are denoted by asterisks; * = P < 0.05, ** = P < 0.01 and *** = P < 0.001. There was a tendency for a significant increase (P = 0.07) in total leukocyte number in beef cows at d 2 compared with d 0 and is denoted by †. Red blood cell number and HCT percentage decreased (P < 0.05) by 6% on d 7 to 21 and by 3% on d 14 and d 21, respectively, compared with pre-weaning baseline. There was no change in HGB concentration post-weaning (Table 1). Post-housing, RBC number was unchanged (P > 0.05), whereas HGB and HCT percentage were increased (P < 0.05) by 2 - 3% on d 7 to 21 compared with pre-housing baseline. a,b,cWithin a row, means differ from pre-weaning baseline by P < 0.05, P < 0.01, and P < 0.001, respectively. d,e,fWithin a row, means differ from pre-housing baseline by P < 0.05, P < 0.01, and P < 0.001, respectively. RBC: red blood cell number, HGB: haemoglobin concentration, HCT: haematocrit percentage. Following weaning, phytohaemagglutinin (PHA)-induced in vitro lymphocyte IFN-γ production decreased (P < 0.05) by 51% on d 2 (mean (s.e.) 0.17 (0.03) OD at 450nm) and by 41% d 35 (mean (s.e.) 0.20 (0.04)) compared with pre-weaning baseline (mean (s.e.) 0.34 (0.05)). The concanavalin A (Con A)-induced production of IFN-γ decreased (P < 0.05) by 49% on d 35 (mean (s.e) 0.30 (0.03)) compared with pre-weaning baseline (mean (s.e.) 0.59 (0.08)). Post-housing, IFN-γ production was unchanged (P > 0.05) for both mitogens (Con A: mean (s.e.) 0.23 (0.04), and PHA: mean (s.e.) 0.24 (0.04)) on d 2 compared with pre-housing baseline (Con A: mean (s.e.) 0.29 (0.03), and PHA: mean (s.e.) 0.20 (0.4)). On d 21, Con A-induced IFN-γ production increased by 110% (P < 0.05; mean (s.e.) 0.58 (0.06)) compared with pre-housing baseline (mean (s.e.) 0.30 (0.03)), whereas PHA-induced IFN-γ production was unchanged (P > 0.05) from pre-housing baseline. Concentrations of fibrinogen and haptoglobin increased (P < 0.05) by 16% and 21%, respectively, on d 2 to 35 compared with pre-weaning baseline (Table 2). Post-housing, concentration of fibrinogen decreased (P < 0.05) by 12% on d 2 and subsequently increased (P < 0.001) by 25% on d 14 and decreased (P < 0.001) by 22% on d 21 compared with pre-housing baseline. Concentration of haptoglobin was unchanged on d 2 and 7 (P > 0.05) but decreased (P < 0.05) by 25% on d 14 and 21 compared with pre-housing baseline (Table 2). a,b,cWithin a row, means differ from pre-weaning baseline by P < 0.05, P < 0.01, and P < 0.001, respectively. d,e,fWithin a row, means differ from pre-housing baseline by P < 0.05, P < 0.01, and P < 0.001, respectively. Post-weaning, concentration of glucose increased (P < 0.001) by 16% on d 2 to d 35 compared with pre-weaning baseline. Concentration of βHB increased (P < 0.001) by 34% on d 2, followed by a 21% decrease (P < 0.001) on d 7, and returned to pre-weaning baseline on d 14 (Table 3). Concentration of NEFA decreased (P < 0.05) by 57% on d 2 to 28 compared with pre-weaning baseline. Post-housing, concentration of glucose did not differ (P > 0.05) from pre-housing baseline, whereas concentration of βHB decreased (P < 0.001) by 21% on d 7 and 14 and concentration of NEFA decreased (P < 0.05) by 63% on d 7 to 21 compared with pre-housing baseline (Table 3). a,b,cWithin a row, means differ from pre-weaning baseline by P < 0.05, P < 0.01, and P < 0.001, respectively. d,e,fWithin a row, means differ from pre-housing baseline by P < 0.05, P < 0.01, and P < 0.001, respectively. NEFA: non esterified fatty acid, βHB: β-hydroxybutyrate. To our knowledge, no other study has characterised the extended physiological, haematological and immunological responses in beef cows to abrupt weaning or subsequent housing. The effect of post-weaning management practice [previously grazed calves, were abruptly weaned (mean age of calf (s.d.) 212 (24.5) d), and either immediately housed in a slatted floor shed or returned to the grazing area for 35 d and then housed] on physiological and immunological responses in the progeny of the cows used in the present study was also measured up to d 35 post-weaning and d 21 post-housing . Behavioural research to date has shown that breaking the mother-offspring bond alone represents a stressful experience for both mother and young . Following separation from their calves, beef cows generally exhibit similar, less intense, reinstatement behaviours (increased locomotor activity and vocalisations) to their young, in an effort to reunite . Consequently, no behavioural measurements were examined as part of this study. The milk yield of the cow breed type (beef × dairy) used in the present study remains relatively high at weaning  and milk would have constituted a significant proportion of the calves' total diet. There is no information in the literature on the extent to which drying off induces a systemic inflammatory response in beef cows, however, there is considerable literature on systemic and local inflammatory responses during mastitis in dairy cows [22–26]. During the drying off period, the mammary gland continues to synthesise and secrete milk which accumulates in the gland. An increase in intra-alveolar pressure as a result of milk accumulation is thought to trigger involution. Involution-associated ultrastructural changes in bovine mammary cells are reported to commence within 48 hours after cessation of milk removal [27, 28] and by day 28 the collapsed alveolar structures remaining are considerably smaller than during lactation. In cows, the alveolar structure is maintained throughout involution and there is no evidence for extensive tissue degeneration that is found in other species, such as rodents [29, 30]. The impact of mammary cell apoptosis in the bovine is not fully characterised. In the present study, all animals were monitored daily and no signs of ill-health were recorded which suggests that there was no underlying systemic infection. The small increase in rectal body temperature recorded post-weaning was not of clinical significance . In accord with the findings of , where cows were separated from their calves when calves were 4 to 6 months of age, weaning was not associated with increased plasma cortisol concentration in cows. In contrast,  using more frequent blood sampling collection time points relative to cow-calf separation than those used in our study, these authors reported increased concentration of cortisol in cows that were separated from their calves 35 days post-partum. The large difference in age at weaning may account for the disparity in cortisol response observed between these studies. The absence of an effect of housing on cortisol concentration contrasts with the findings of  who reported an increase in concentration in previously grazed cows that were housed. However, in the latter study, cows were tethered, whereas in the present study cows were loose-housed in pens. In the present study, concentration of DHEA was not affected by weaning. This hormone is episodically co-secreted with cortisol from the adrenal gland and is also a potential precursor for androgen and oestrogen synthesis in cattle . Post-housing, concentration of DHEA decreased without a concomitant increase in cortisol. Increased cortisol: DHEA ratio was reported in lame dairy cows  and following transportation of young bulls  and was suggested as a potential biomarker of stress. The unaltered cortisol: DHEA ratio found in the present study suggests that the practice of weaning and housing were insufficient to elicit a physiological stress response, whereby a shift occurred in the steroidogenic pathway towards cortisol at the expense of DHEA. Further research investigating the use of cortisol: DHEA ratio as a biomarker of stress is warranted. Peripheral blood cells are sensitive indicators of patho-physiological responses and may be used to define subclinical disease states in cattle . Alterations in circulating leukocyte subsets have been documented in beef cattle under various management practices such as restricted space allowance during housing of steers , transportation of bulls , and weaning of calves [12, 36]. In agreement with the latter studies using calves, increased neutrophil number and decreased lymphocyte number (increased N:L ratio), was evident in cows post-weaning. The magnitude of the increase in neutrophil number was higher (33% versus 18%) on d 2 post-weaning compared with d 2 post-housing in cows. The changes observed in red blood cell number, haemoglobin concentration and haematocrit percentage in cows were negligible suggesting that there were no negative consequences of weaning or housing on these variables. The decrease in IFN-γ production on d 2 compared with pre-weaning baseline was consistent with the findings of  who weaned calves and returned them to pasture and with  and  using weaned calves that were immediately housed. In the present study, the relative decrease in PHA-induced IFN-γ production on d 2 post-weaning may be a consequence of decreased lymphocyte number. An absence of a decrease in PHA-induced and Con A-induced IFN-γ production in cows on d 2 post-housing suggests that housing was insufficient to elicit a stress response, and these findings are consistent with  who reported unchanged IFN-γ production post-housing in calves that were previously grazed. While lymphocyte number was decreased on d 2 post-housing, in the present study, there was no associated reduction in PHA-induced or Con A-induced IFN-γ production, suggesting that the function of the cells to produce IFN-γ was not impaired. Overall, these results suggest that cows were more sensitive to the effects of weaning than to the effects of housing due to the less marked neutrophil response and unchanged IFN-γ production observed post-housing. Cows may also be less sensitive to weaning- and housing-associated stress, as indicated by the relatively lower change in neutrophil number and IFN-γ production, compared with their calves . Post-weaning, cows had increased concentrations of plasma fibrinogen and haptoglobin, which is in agreement with the results obtained for calves following abrupt weaning . Following housing, no clear trend was evident for the acute phase protein response. The response post-housing may have been influenced by the change in dietary crude protein concentration. Blood metabolite concentrations indicate the extent of metabolism of energy, protein and other nutrients and thus, can provide information on the nutritional status of cattle. Typically, stressful events result in reduced feed intake and depletion of energy stores in cattle . 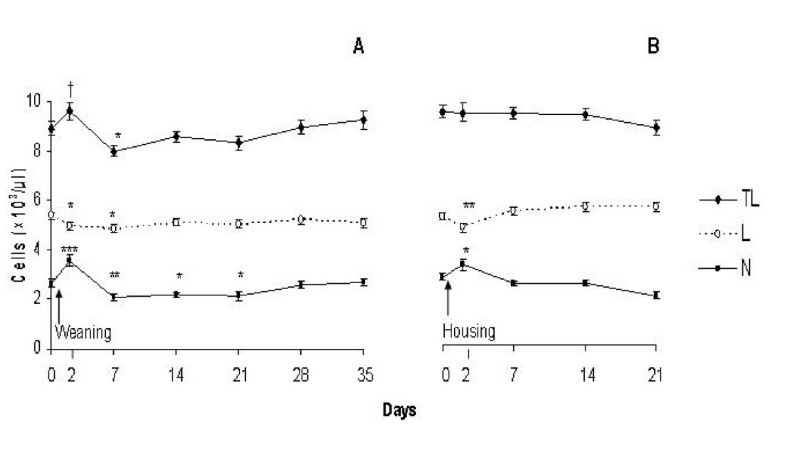 In the present study, weaning and subsequent housing caused transient changes in blood metabolites. Increased concentration of glucose is often attributed to glycogenolysis, which is associated with increased catecholamines and glucocorticoid secretion at the onset of a stressor . However, due to the unaltered cortisol response throughout the study, it is unlikely that the increased concentration of glucose is solely a consequence of weaning as a stressor, but rather an indication of a more positive nutritional status in the cow due to the cessation of nursing. Generally, higher concentrations of NEFA and βHB and lower concentrations of glucose are associated with negative energy balance in beef cows . Thus, the opposing trend of concentrations of plasma glucose and NEFA suggests that removal of the calf from the cow resulted in a more positive nutritional state in the cow. Under the conditions of the present study, animal was the experimental unit and was specified as a repeated measures effect in the statistical analysis and most of the physiological and immunological variables which changed as a consequence of i) weaning and ii) housing had recovered to baseline values on completion of the study. In the present study, while changes were found in physiological and immunological variables in response to weaning and subsequent housing, the values were within the normal physiological ranges for cattle [35, 39–41]. In conclusion, abrupt weaning results in neutrophilia and lymphopaenia coupled with reduced in vitro lymphocyte production of IFN-γ and increased acute phase protein response suggesting that weaning elicited a transitory stress response in first parity beef cows. Post-housing, transitory neutrophilia and lymphopaenia were evident, however unchanged total leukocyte number and IFN-γ production and the lack of a clear trend in the acute phase protein response indicates that housing did not elicit a stress response as great as weaning in the beef cow. All animal procedures performed in this study were conducted under experimental licence from the Irish Department of Health and Children in accordance with the Cruelty to Animals Act 1876 and the European Communities (Amendment of Cruelty to Animals Act 1876) Regulation 2002 and 2005. Thirty-six first parity, spring-calving (mean date of calving (s.d) March, 19 (25.5) d; mean age at calving (s.d.) 756 (24.3) d), single-suckled Limousin × Holstein-Friesian (n = 18) and Simmental × Holstein-Friesian (n = 18) cows were used. Cows and their progeny were rotationally grazed on a predominantly perennial ryegrass (Lolium perenne)-based sward from early April until weaning on 17 October. The pasture had a mean (s.d.) dry matter digestibility (DMD) of 750 (22.1) g/kg and mean (s.d.) crude protein (CP) concentration of 229 (8.7) g/kg DM. On the day of weaning (day (d) 0), cows and calves were moved to a handling yard where the cows were abruptly separated from their calves (mean age (s.d.) 212 (24.5) d; mean weight (s.d.) 279 (38.0) kg) and were returned to the grazing area for a 35 day (d) period. The grazing area was located at a sufficient distance away from the handling yard thus, vocalisations between the cows and calves could not be heard. On d 35, the cows were housed indoors in a slatted floor shed in 6 pens (n = 6 cows per pen). Each pen was equipped with automatic water drinkers and cows were offered grass silage ad libitum (mean (s.d) DMD 714 (17.7) g/kg; CP 144 (11.3) g/kg DM) plus 60 g of a mineral vitamin supplement daily. Forage analysis methodology was carried out according to . Blood samples were collected from the cows by direct jugular venipuncture to evaluate i) the effects of weaning (d 0 (pre-weaning baseline), 2, 7, 14, 21, 28, and 35) and ii) the effects of housing (d 0 (pre-housing baseline), 2, 7, 14 and 21) (Figure 3). Blood (10 mL) samples collected into blood tubes (Vacuette, Cruinn Diagnostics, Ireland) containing lithium heparin were used to determine plasma concentrations of cortisol, DHEA, haptoglobin, glucose, NEFA, βHB, and for the determination of in vitro lymphocyte production of IFN-γ from a whole blood culture. Blood samples were collected by direct venipuncture on d 0 (weaning) and 2, and on d 0 (housing) and 2 and 21 for the determination of in vitro lymphocyte production of IFN-γ. Blood (4 mL) was collected into vacutainer tubes containing sodium citrate for the subsequent assay of plasma fibrinogen concentration. An additional 6 mL of blood was collected into vacutainer tubes containing K3EDTA for haematological determination. All samples were transported to the laboratory at ambient temperature and processed within 2 h of collection. Management and blood sampling schedule. Management and blood sampling schedule for beef cows that were abruptly separated from their calves and i) returned to pasture on d 0, and ii) subsequently housed in a slatted floor shed on d 35. Sampling occurred at 7 d intervals except for immediately post-weaning and post-housing where a 2 d interval was allowed for sampling. Rectal body temperature was recorded prior to blood sampling, as previously described, using a digital centigrade (°C) thermometer (Jørgen Kruuse A/S model VT-801 BWC, Marslev, Denmark; catalogue No. 0701). Plasma was harvested from lithium heparin and sodium citrate anti-coagulated blood following centrifugation at 1600 × g at 4°C for 15 min and stored at -80°C until assayed for cortisol, DHEA, haptoglobin and fibrinogen, glucose, βHB and NEFA. Plasma cortisol and DHEA were assayed using the Correlate-EIA kits from Assay Designs (Ann Arbor, MI, USA). The mean intra-assay CV (n = 5) for cortisol and DHEA was 8.7% and 5.3%, respectively. The corresponding mean inter-assay CV (n = 8) was 6.9% and 4.5%. Assay sensitivity for cortisol was 56.7 pg/mL and for DHEA was 2.9 pg/mL. The ratio of cortisol: DHEA was calculated. Concentration of plasma haptoglobin was measured using an assay kit (Tridelta Development Ltd., Wicklow, Ireland) on an automatic analyser (spACE, Alfa Wassermann, Inc., West Caldwell, NJ, USA) according to the procedure of . Concentration of plasma fibrinogen was measured according to the method of  on an automated analyser (spACE, Alfa Wassermann, Inc., West Caldwell, NJ, USA). Concentrations of plasma glucose, NEFA, and βHB were determined using an automatic analyser (Olympus AU400, Japan) using assay kits supplied by Olympus. Total circulating leukocyte number, neutrophil and lymphocyte number, RBC number, concentration of HGB, HCT percentage were determined from K3EDTA anti-coagulated whole blood using an automatic haematology analyser (AV ADIVA 2120, Bayer Healthcare, Siemens, UK) equipped with software for bovine blood. Neutrophil: lymphocyte (N:L) ratio was calculated. A whole blood culture procedure  was used to determine the in vitro lymphocyte production of interferon-γ (IFN- γ) in lithium heparinised whole blood. Duplicate 1.48mL aliquots of blood were cultured in sterile 24 well flat culture plates (Sarstedt Ltd., Drinagh, Wexford, Ireland) with 20 μL of phosphate buffer saline (PBS) (GibcoBRL, Life Technologies Ltd., Paisley, Scotland, UK) containing 1.0 mg/mL of concanavalin A (Con A) (Sigma-Aldrich, Inc., UK), 1.0 mg/mL phytohaemagglutinin (PHA) (Sigma-Aldrich, Inc., UK) or no additive, for 24 h at 37°C and in an atmosphere of 5% CO2. The culture plates were then centrifuged at 1600 × g at 4°C for 20 min, supernatant harvested and frozen at -20°C until assayed for INF-γ using an ELISA procedure specific for bovine plasma (BOVIGAM, Biocor Animal Health, NE, USA), as previously described . The in vitro Con A or PHA stimulated production of IFN-γ was calculated by subtracting the absorbance at 450 nm of wells that received PBS alone from wells that received Con A or PHA, respectively. Data was analysed as 2 separate datasets relative to management practice: i.) weaning (d 0 to d 35), and ii.) subsequent housing (d 0 to d 21). Each dataset was analysed as repeated measures using the PROC MIXED procedure of SAS (Version 9.1, SAS Institute, Cary, NC) with an unstructured covariance matrix within animal. Breed (Limousin × Holstein-Friesian and Simmental × Holstein-Friesian) and sampling time were listed in the model statement. Breed was not significant and was excluded from the final model. Least squares means were estimated and differences between least squares means were tested using the PDIFF option in SAS. A probability of P < 0.05 was chosen as the level of significance. The authors acknowledge E. Mulligan for skilled technical assistance, the farm staff at Teagasc, Grange Beef Research Centre for the care and management of the animals, the staff of Grange laboratories for feed analysis and J. Larkin and M. Murray (Teagasc, Animal & Grassland Research and Innovation Centre, Grange) for blood sample analysis. Thanks are also extended to W. Byrne, H. Cameron and M. Hill at the CVRL, Department of Agriculture, Fisheries and Food Laboratory Complex, Co. Kildare, Ireland for their assistance in blood sample analysis. This work was funded by a Teagasc Walsh Fellowship and a John Hume Scholarship to E.M. Lynch. BE and MMcG designed the study. EL and BE performed the experiments. BE and EL analysed the data and EL prepared the manuscript. EL, BE, MMcG and SD contributed to, read and approved the final manuscript.